Looking for increased energy, more meaning in your life, more commitment to who you are? Thru my books you’ll find your own answers, unearth real life solutions, and turn passion into plans. Designed to bring a greater awareness of creativity's untapped potential for cellular healing, transformational well being and extreme joy! Dynamic, thought provoking, full of creative prowess these play-full booklets are being distributed thru SuZ's Heal lt Forward Program to doctors, therapists, hospitals, spas, rehab centers, classrooms, career centers and dentists to be shared, touched, glanced at, and pondered to create new possibility and choice with a fresh perspective. My first book "Wake Up Your Magic" chronicles my journey from a deep slumber to a more enriched life. Let my steps help guide you to your path. 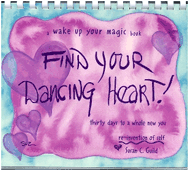 My second book "Find Your Dancing Heart" is a creative workbook that frees you. It started as a workbook for a client during “February Heart Month”. 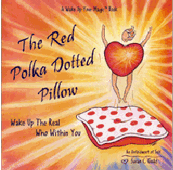 My third book "The Red Polka Dotted Pillow" brings you further along to who you are. This book became an elixir for healing. Creativity truly saved my life. Unearth your “what if-s”. Come journey with me to see how fitting the pieces of the puzzle impacted my life path. Learn how my story - set in verse - shaped a passionate, purposeful life along with opening doors I never could have imagined. Expressing truth and creativity through poem making woke me up to find what I thought I had lost. What are your hidden goals and dreams? What will make you move forward? Thru powerful creative nudges tap into an increased energy flow to wake up your magic again and again. Celebrate you. Honor your personal growth and spiritual quest. Get started today to make your heart sing! No matter what stage you are in life, inspirational solutions are only a fingertip away. Completely hand illustrated with wise whimsical illustrations. "I experienced extreme physical and emotional trauma due to a tragic accident. I happened upon Suz'S book, The Red Polka Dotted Pillow. My journey through this book gave me the inspiration to face another day. Every morning I felt excitement in the message I would find in Suz's words. My favorite on page 44 is 'Create Those Stairs of Inner Peace.' The wisdom in the play reminded me that no matter what I was still a whole person with much to give." 30 days to a whole new you! Most successful people keep a journal! Claim the life you dream of with focused inner connection – the creatively infused heart energy. The secret sauce of this book is building with repetition to heal and transform the magic within. Day by day, step by step revisit significant ponderings and musings. Put pen to paper to cultivate a personal plan of action to move forward in all areas of life. Better yet let this journal become a safe haven with emphasis on a specific desired area i.e., a new creative business venture or finding the perfect home. Commit now to 30 days* of bite- sized action to let the magic begin. *It takes 30 days to start a new habit. The more I create, the more I am free! Even the quality of the paper I use has inspired me to paint, color, doodle, play, and draw. These beautiful illustrations open me up to greater possibilities, choices and options. Let them inspire you, too! "When I first met with SuZ the first time I knew my life would be changed by her... Did not know how, but I just knew...she has an incredible spirit and presence that needs to be experienced! I agreed to do her class of Dancing Hearts with some reservations honestly... But I will tell you if you want to changed your life through creativity you want to change it through SuZ... Her book Dancing Hearts is an incredible journey through your own life that teaches you what to do and how to achieve Success through Creativity. Circle Power is the best when you do it in a group! Wake Up the Real Who Within You! Tap into your inner voice, divine wisdom and acceptance of those around you. Let your inner playmate (gut instinct) 'the illustrated heart character' reveal joy in play. Discover inner peace in turmoil. Transform pain into forms that nourish the soul. 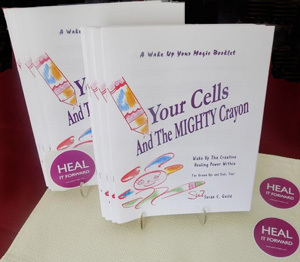 Scampering through the pages interweaving the Wake Up Your Magic Twelve Principle Approach, your inner playmate unlocks a well of creative expression longing to be heard. Reconnect with joy-full living. Giggle with delight when dreams come true that have been stuffed under the pillow for lifetimes. Do alone, with a buddy or in a group. Divinely illustrated, the enchanting heart person touches your heart again and again. Change relationships, home and family to a happy healthier life. "Each book was born out of my own intense yearning for more fulfilling life"